I recently saw a meme about how tired we are of hearing about introverts. There’s been a lot of that going around lately, so I apologize for carrying on about it here. I do this not because it’s the thing to do, but because I’ve been reading and thinking about it lately. It has been a great exercise in understanding myself more and in identifying strengths and weaknesses. One of my seminary professors once told our class that the majority of pastors are introverts. A useful, but shallow, definition of an introvert is someone who is energized by solitude (and its related activities) and whose strength is drained in crowds (and their related activities). Desiring solitude is not the same as shyness; an introvert is not necessarily shy, however. As I say, this is a very shallow definition of introversion and really doesn’t do justice to the nuances and spectrum of the trait. But it’ll do for now. If my professor’s statistic is true, it’s an interesting one to consider. On the positive side, an introverted pastor is suited to the calling of preaching and teaching, which requires significant time studying in solitude. On the potentially negative side, an introverted pastor is nevertheless required to spend significant time with people. I say potentially, because to be an introvert is not to say that one doesn’t like people or spending time with them. Rather, it means that a good portion of the introverted pastor’s work is work that drains rather than energizes. I am not a pure introvert (I assume that few people, if any, are), so I find Sunday mornings, for example, both energizing and very draining. But I’m thinking of this at the moment in terms of the introverted pastor (me) at home. At church and youth functions, I am relatively lively and energetic, making a point of interacting with people. At home, I tend to be quiet and solitary (as far as that’s possible with a wife and kids). That doesn’t mean I’m pretending at public functions, acting like something I’m really not. It just means that I’m drawing on a different part of who I am, or like a rechargeable battery, at public church functions I’m a battery plugged in and making the bunny walk and beat its drum, whereas at home I’m a battery plugged into the charger. What I’ve wondered about it when the two worlds collide: when someone from the church or a one of my youth is over for non-“official” reasons. What does is it like for them to experience me recharging at home—not very talkative, reading, keeping to myself? Can those two “sides” of me coexist in their minds? Should I plug the battery back into the bunny when people come by? Sometimes I do, but not always. It’s one reason I think understanding personality can be very important in communities like the church. We live in a world in which extroversion is generally assumed to be the ideal (see Quiet: The Power of Introverts in a World that Can’t Stop Talking by Susan Cain). Misunderstandings can occur when we don’t understand how people are wired, or more specifically, how each person is wired in a unique way. Our expectations of others can easily be shaped by either the ideal or dominant personality within a community (and extroversion is by nature dominant). 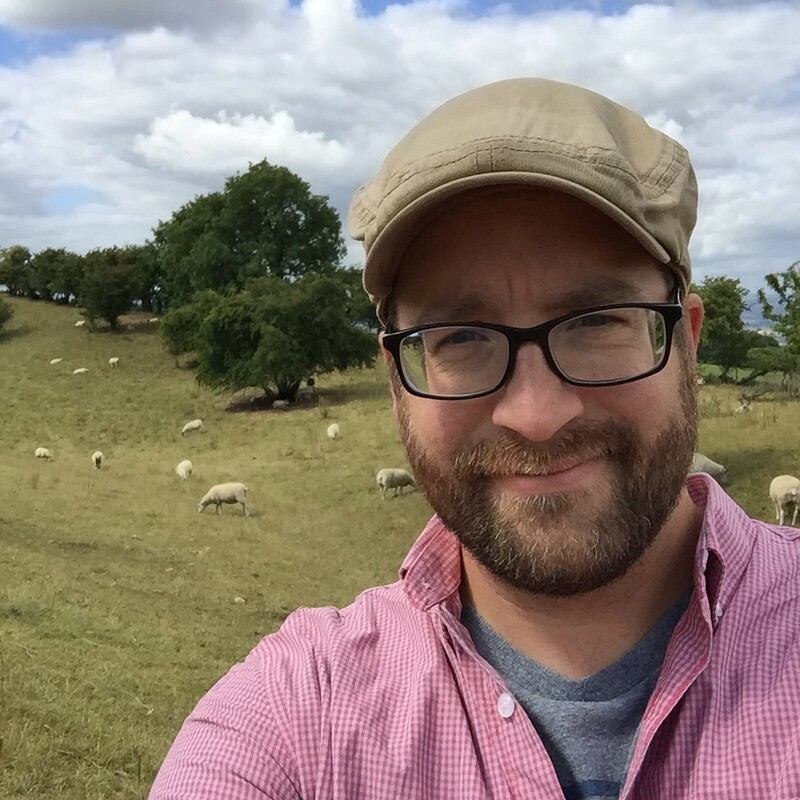 This entry was posted in Environment/Nature, Musings, Pastoring on November 13, 2014 by Marc. I have loads of reading to do with a theology class I’m taking (in San Diego!) at the beginning of February, which is precisely why I’ve started reading Bill Bryson’s A Short History of Nearly Everything again. Because that’s what I do when there are things to get done: distract myself with other things. The question that naturally occurs is “What would it be like if a star exploded nearby?” Our nearest stellar neighbour…is Alpha Centauri, 4.3 light years away. I had imagined that if there were an explosion there we would have 4.3 years to watch the light of this magnificent event spreading across the sky, as if tipped from a giant can. What would it be like if we had four years and four months to watch an inescapable doom advancing toward us, knowing that when it finally arrived it would blow the skin right off our bones? Would people still go to work? Would farmers still plant crops? Would anyone deliver them to the stores? Weeks later, back in the town in New Hampshire where I live, I put these questions to John Thorstenson, an astronomer at Dartmouth College. “Oh no,” he said, laughing. “The news of such an event travels out at the speed of light, but so does the destructiveness, so you’d learn about it and die from it in the same instant” (36). So it takes 4.3 years to reach us, moving through 4.3 light years of space in that time–that is, moving from A to B and covering the distance between–but we would never see it approaching. I imagined it, much like Bryson, rather like watching a ball approach one’s face from a distance. Not so. Instead, it would kind of be like the running scene in Monty Python and the Holy Grail, except without the extended approach–Sir Lancelot would simply appear suddenly at the gate and kill the guards without warning. I understand that (as far as we know) light is the fastest thing in the universe and we wouldn’t see the event until it reached us, meaning that as soon as we saw the event it would have arrived. Conceptually I get it. But it nevertheless boggles my mind–I can’t “see” it in my imagination. 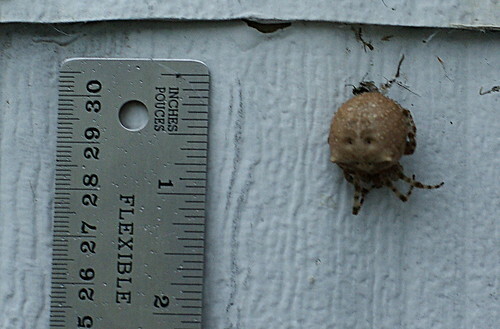 This entry was posted in Environment/Nature, Musings, Reading on December 25, 2012 by Marc. Fishing at a neglected historical site. The mouth of the irresistibly-named Rat River, which forms the meandering southern boundary of the Providence campus as it flows toward the Red River of rebellion and flood fame, lies about 20kms northwest of Otterburne. Dixie had heard that someone had caught some fish at the mouth and since it was nearby I planned to try fishing there with Olivia. That plan was waylaid by a brief but painful bout of strep throat. Today, however, was the day. Google maps’ satellite view indicated that access to the mouth of the Rat River was a short gravel road off one of the main highways. 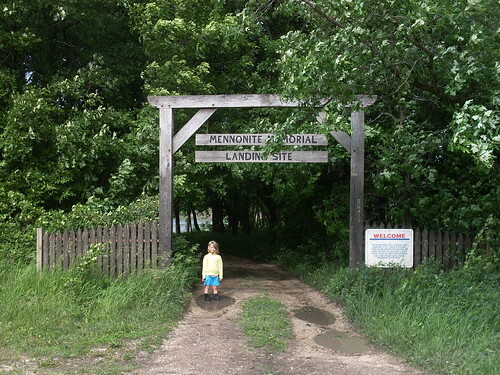 The map didn’t indicate anything topographically or otherwise significant, but in fact there is a gate there indicating that we would be entering Mennonite Memorial Landing Site. 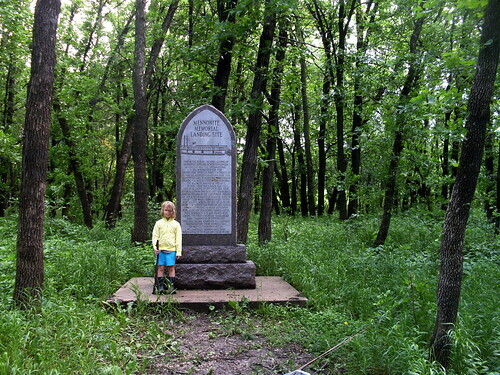 I thought it wasn’t much more than a reasonably well-kept nature area until I noticed the marble monolith standing some way back in the forest. How about that? If that isn’t a significant historical site, I don’t know what is. But why isn’t it on the map? Why isn’t there any signage on the highway nearby? How many Manitoba Mennonites know that it all started here? All of this is on the Red River floodplain. You pass through treeline fifty yards deep, in which the monolith marking the site’s historic significance stands. The other side opens up into clay covered in fresh vegetation–the water on the Red River rises high in the spring even in non-flood years such as this one. The boot-sucking shore of the river is littered with old cans, broken beer bottles, recently gorged-on watermelon husks, and other detritus. It’s a shame that such a significant point of interest is treated more like a dump for those fishing there. But it’s otherwise a beautiful spot (and great company)! But I’m not writing this piece of faux travel literature to bore you! No, I say, it was a monumental day in the Vandersluys household! So Olivia and I came here to go fishing together. We made our way down the dirty, sticky shore. There were a couple of men already fishing. They spoke in a foreign language. As we approached, I assumed it would be German, but it sounded more like Ukrainian. We moved off to our own corner of the shore, farther into the mouth. The men were casting their lines and letting their poles sit on forked branches jammed into the clay on the shore. I couldn’t tell what they were using for lures, but I felt conspicuously wrong in taking my standard cast-and-reel approach. They brought in a fish each as we were setting up. The caught a couple more while Olivia did some practice casting with a de-hooked weighted lure and I cast-and-reeled my generic rubbery/wormy lure. I kept spying on them to see what they were using. I couldn’t tell. Looked like fresh bait–chicken livers, maybe? 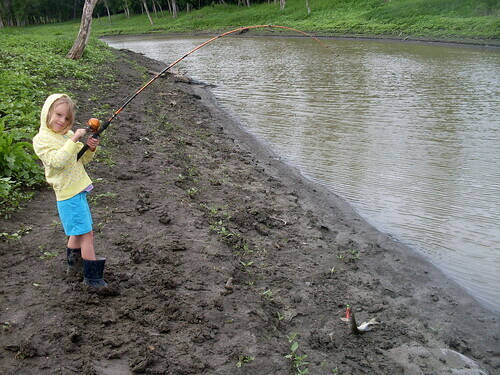 Olivia was ready to fish with a real hook. 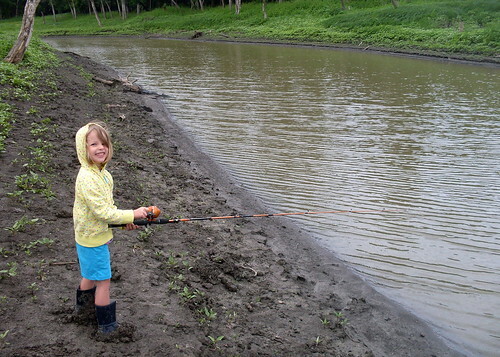 I asked her which hook and rubbery lure thing she wanted (you can tell I’m a fisherman, right?). She picked what she thought were the brightest and best colours. Away she went. 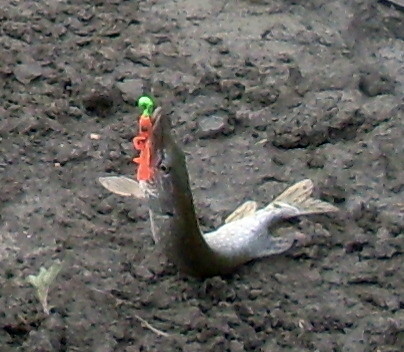 One of the other guys had switched his lure to a large spoon/floating-fish kind of lure. I cast out my line a couple of times. Then I hear splashing and–what do you know!–Olivia has a little jack on her line! Huzzah! The other guys noticed. A friend of theirs who must have been fishing around the bend came and I think took a picture. I slipped and slided around the shore trying to get a quick picture of Olivia with the fish so that I could unhook it and let it go before it died. I got the picture and the fish jumped off the line on its own! A good morning with Olivia. 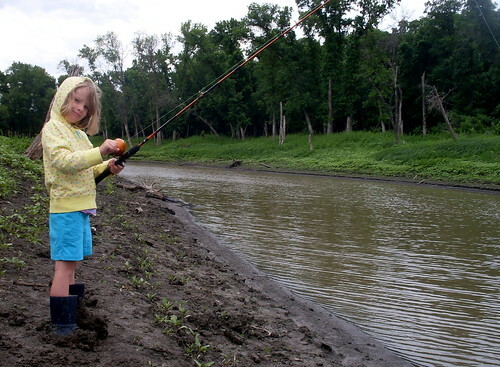 This entry was posted in Environment/Nature, Family and tagged Family, fishing, history, Rat Rier, Red River on June 13, 2012 by Marc.